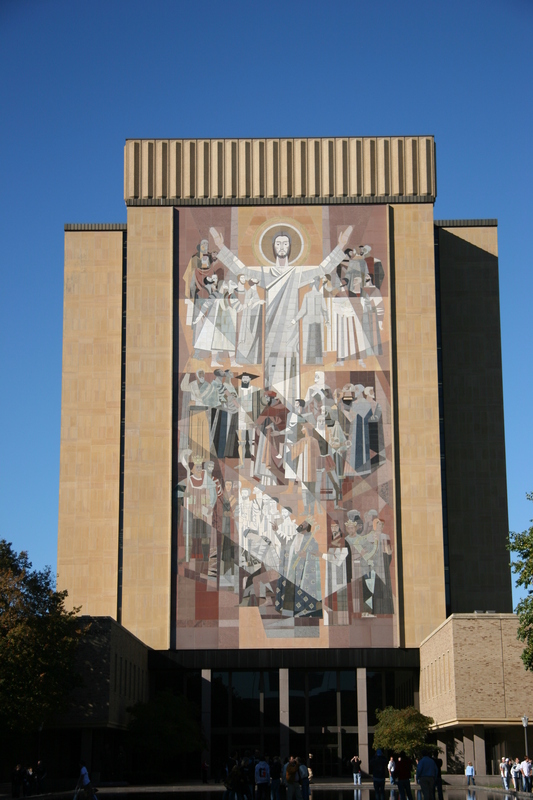 Knute Rockne, the leprechaun, and Touchdown Jesus can only be associated with one school–the University of Notre Dame. The school has won over 850 football games and has 13 national championships. They are known as the Fighting Irish. Before that name took hold, the school was known as the Catholics then the Ramblers. No one knows for sure how the Fighting Irish nickname came to be, but several stories do exist. The first story involves the Northwestern game in Evanston, Illinois in 1899. At the end of halftime, Northwestern fans began to chant–“Kill the Fighting Irish, kill the Fighting Irish,” and purportedly, Notre Dame officials deemed the moniker appropriate. The next story involves halftime of the Michigan game in 1909. Many of the Notre Dame players had Irish surnames such as Kelly, Duffy, and Ryan. With Notre Dame trailing, one of the players reportedly yelled to his teammates, “What’s the matter with you guys? You’re all Irish and you’re not fighting worth a lick.” Notre Dame came back to win the game and reporters who overhead the remarks wrote that the Fighting Irish were victorious. The term Fighting Irish has been applied to Notre Dame teams for years… at the time the title the Fighting Irish held no glory or prestige…the years passed swiftly and the school began to take a place in the sports world…Fighting Irish took on a new meaning…the team has become our heritage…so truly does it represent us that we are unwilling to part with it. No one knows the true story, so take your pick. What is certain is that the Fighting Irish is one of the most recognizable names in college sports. So cheer, cheer for Ole Notre Dame! Over 80,000 people gather at Jordan-Hare Stadium every Auburn University home football game to experience Southeastern Conference (SEC) football in one of the nation’s great on-campus venues. About 15-20 minutes before kickoff, the marching band plays the fight song on the field and the electricity and energy in the stands rises. Then seemingly out of nowhere, a live eagle begins to glide around the inside of the stadium, slowly descending until landing near midfield. As the Auburn football team readies to enter the field, the Auburn faithful by the thousands regale the area with one of the more famous chants in college football, “War Eagle.” Besides yelling the chant at athletic events, fans may employ the chant as a form of endearment, a greeting, or salutation among other Auburn fans. The chant and the eagle mascot have been Auburn traditions for years and the following hopes to enlighten those unfamiliar with the stories behind the traditions. Outside the Auburn fan base, very few people know the origin of the chant. The true Auburn fan will offer you four possible stories. One involves a veteran of the Civil War watching Auburn’s first football game in 1892 with his pet eagle found on a battlefield during the war. According to witnesses, the eagle broke free of the veteran and began circling the playing field at Atlanta’s Piedmont Park as Auburn drove for the winning score against Georgia. As the Auburn fans watched their team drive down the field with the eagle circling above, they began to yell “War Eagle.” At the end of the Auburn victory, the eagle crashed to the ground and died. A second story comes from Auburn’s 1914 game against the Carlisle Indians. The Indians’ best player was named Bald Eagle. Auburn ran play after play right at him in hopes of wearing him down. Without huddling, the Auburn quarterback yelled Bald Eagle to start each play. Auburn fans thought the quarterback was yelling War Eagle and began shouting the name before every play. When an Auburn player scored the winning touchdown, he supposedly yelled War Eagle and the cry became a tradition. The final story has its links to the Saxon Warriors. When buzzards circled the battlefield after a Saxon victory, the warriors yelled “War Eagles” as their victory cry. 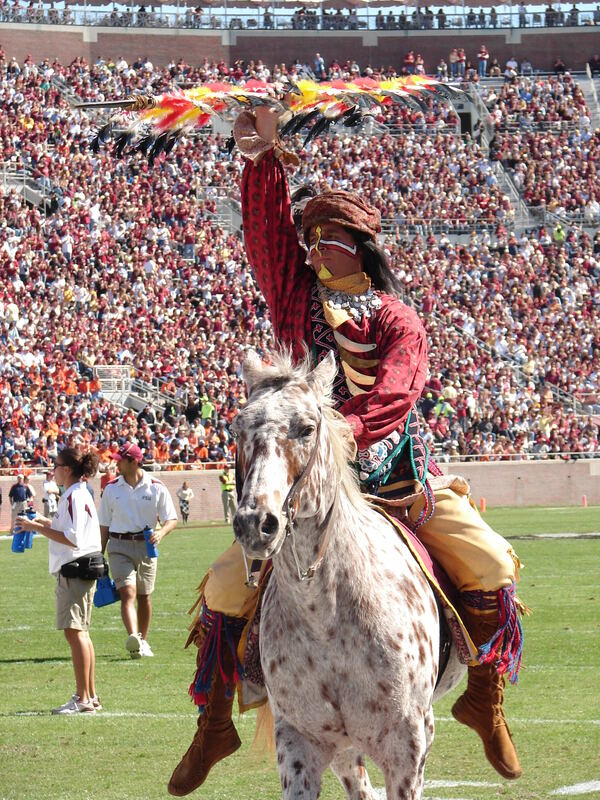 The live eagle mascot is called War Eagle. The eagle, real or contrived, from the 1892 Agricultural and Mechanical College of Alabama (now Auburn)-Georgia game receives credit as War Eagle I. According to legend, during the Battle of The Wilderness in Virginia, a former AMCA student from Alabama was the sole Confederate survivor. As he struggled to cross the battlefield, he happened upon a young, wounded eagle. The soldier gathered the young bird and nursed him back to health. The young man eventually joined the Auburn faculty and brought the eagle with him. The eagle became a well-known figure on the Auburn campus. In1892, the eagle and the old soldier attended Auburn’s first football game against Georgia. The eagle broke away from the man, flew around the field, and crashed to his death upon the Auburn victory. Whether the legend is true is open to debate, but it does make for a great story. War Eagle II came to Auburn in 1930. A golden eagle became entangled in some vines while hunting its prey on a farm southwest of Auburn. As the story goes, the farmer sold the eagle to some people for $10 and it ended up in the care of two Auburn cheerleaders. The cheerleaders put the bird in a wire cage and took it to Columbus, GA for the South Carolina game. Auburn had not won a Southern Conference game in four years but vanquished the Gamecocks that day, 25-7. The student body concluded the eagle brought victory that day and should remain a part of Auburn tradition. The eagle remained in a cage on campus attended to by the cheerleaders. No one knows for certain the rest of War Eagle II’s story. The next eagle in the War Eagle line, War Eagle III, arrived on campus in 1960. A Talladega County farmer found the bird caught between two rows of cotton, gave it to authorities, who then gave it to the Alpha Tau Omega fraternity. The Alpha Phi Omega fraternity built a cage for the eagle and began a run of about 40 years as caretaker of the eagle mascots. Unfortunately, War Eagle III escaped his leash during the Tennessee game in Birmingham in 1964 and was found shot to death in a wooded area near Birmingham. The Birmingham Downtown Action Committee located another golden eagle at the zoo in Jackson, MS and presented it to Auburn in October 1964. War Eagle IV lived on campus in a large aviary. The aviary, the second largest single-bird cage in the country, stood until razed in 2003. A new tradition began when War Eagle IV received the nickname of “Tiger.” The 22-year old golden eagle served Auburn for 16 years before dying of natural causes. War Eagle V came from Wyoming in 1981 under the stewardship of the United States government under the stipulations of the Endangered Species Act and was on loan to the Auburn University Veterinary School. The bird also took the nickname of “Tiger.” Tiger served for five years before dying from a ruptured spleen at the age of eight. War Eagle VI came to Auburn on loan under the same government arrangement as War Eagle V. During the 2000 season, War Eagle VI became the first of the line to perform the pre-game ritual around the inside of Jordan-Hare Stadium. The Southeastern Raptor Rehabilitation Center in Auburn took over care of War Eagle VI and all other eagles beginning in 2000. War Eagle VI gained international fame when the golden eagle flew around Rice-Eccles Stadium in Salt Lake City, UT as part of the opening ceremonies of the 2002 Winter Olympic Games. The school retired the eagle on November 11, 2006, and she lived to be 34 years old before dying in 2014. The current eagle mascot, War Eagle VII, came to Auburn six months after birth at the Montgomery Zoo in 1999. The golden eagle immediately took over for War Eagle VI and currently shares the traditional pre-game flight with two more eagles, another golden eagle and a bald eagle. War Eagle embodies two of the great Auburn traditions. The chant and the eagle have not only captured the hearts and souls of the Auburn faithful but have earned the honor of two of the most famous and recognizable traditions in college athletics. When you hear the words “University of Tennessee football,” what comes to mind? Maybe an image of an orange-clad team with a “T” on the side of the helmet that plays in a big stadium with the song “Rocky Top” seemingly played every five minutes. But how many of you know how the school decided on orange as their main color, or the nickname “Volunteers” or the Rocky Top song? Charles Moore, a member of the 1891 football team, thought the colors of orange and white would be suitable. These were the colors of the American daisy that grew in abundance on the Tennessee campus. The student body voted to approve the nomination of the colors at a later date. Interestingly, the first orange jerseys were not worn until the 1922 season. The school gets its nickname from the state motto. Tennessee acquired the name “Volunteer State” during the War of 1812 after General Andrew Jackson led a group of about 1500 volunteers to fight against the British at the Battle of New Orleans. Several decades later Tennessee sent 30 thousand volunteers to Texas to aid in its fight against Mexico. So the Volunteers seemed an appropriate nickname for the school. At all athletic events, UT’s color guard wears 1840s dragoon uniforms similar to those worn during the fight against Mexico. 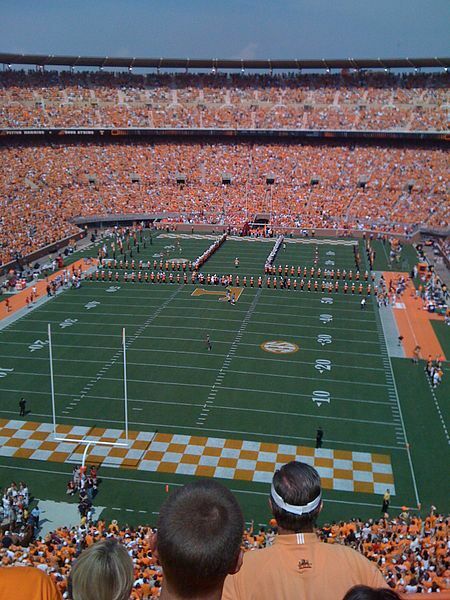 The song “Rocky Top” was first played at halftime of the 1972 Tennessee-Alabama football game as part of a country music show. The Tennessee faithful immediately embraced the song and the UT band made it part of its game music repertoire soon after. The University of Tennessee has a proud athletic tradition. The school’s “Volunteer” nickname, orange uniforms, and classic song give the school instant recognition among college sports enthusiasts. Gator bait. Gator bait. Gator bait. Make no doubt about it, when you’re talking Gators and college football, you’re talking about the University of Florida. Here’s a quick look at how the gator moniker became associated with the school. Florida opened in 1905 and began playing football in 1906. It was around that time that the alligator became the symbol and nickname of the school. Gainesville native Austin Miller enrolled at the University of Virginia law school in 1908. Austin’s father, Phillip, visited him in Charlottesville and decided to order some pennants and banners for sale in his Gainesville store. The two visited a company that manufactured pennants. When the company representative asked the Millers what the symbol for the University of Florida was, they realized the school had none. Austin told the company rep that he believed the symbol was the alligator. Austin quickly thought of the alligator because it was native to the state and as far as he knew, no other school had an alligator as its symbol. The company rep designed an alligator for the pennants and banners based on a picture Austin provided from the University of Virginia library. Phillip brought the pennants and banners back to his Gainesville store. The pennants and banners portrayed an alligator in different poses. Some only portrayed an alligator head. One banner was blue with an orange alligator in the middle. This banner became the first official symbol of the school and the gator name took its home in Gainesville. Albert, the first live alligator, appeared on campus in 1957. Several Alberts have served since. A costumed gator, also called Albert, began roaming the Gator sidelines in 1970. Albert’s friend, Alberta, joined him in 1986. You may be thinking that a better story surely exists for the origin of the Gator nickname–like maybe a gator eating a horse or something on the very site of Florida Field years before the first football game–but you would be mistaken. At any rate…Go Gators!